Final Hour is the debut release from Norway's Illusion Suite, a melodic power/progressive metal quintet signed to Limb Music. As with most current offerings in this style, Illusion Suite is doing little here to reinvent the wheel. Simply, Final Hour has all the necessary elements for fine, yet traditional, melodic heavy metal with enough variations within some song to have progressive overtones. Fortunately, with so much predictability in this genre, Illusion Suite is adept at making the traditional both inviting and entertaining. Final Hour displays Illusion Suite's well practiced skills and fine song craftsmanship. Though all the reliable elements are here, they are arranged quite well for brisk and interesting arrangements. Every song has an epic feel thanks to the generous layers of keyboards for a symphonic foundation. But the band's compositional technique and musicianship is best felt on the two longest songs, A Moment to Remember and The Adventures of Arcan. Both songs more time to develop and the musicians more freedom to flex their muscle. Yet Final Hour is not all faux strings and bombastic novelty. 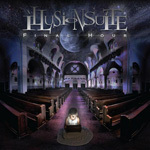 Illusion Suite easily keeps the heavy in the metal with songs like The Wire and Once We Were Here. Other notable characteristics are the lush vocal arrangements and powerful rhythm section with kudos to bassist Dag Erik Johnsen. While some will pass on Illusion Suite as being just another Scandinavian power/prog band, I would not be so quick to dismiss them. Certainly, their style isn't going to turn the genre on its head, but Final Hour is quite well done with powerful well-crafted songs invigorated by equally dynamic musicianship. With this combination, Illusion Suite breathes some fresh air into this oft maligned and stagnant genre. Recommended! While some will pass on Illusion Suite as being just another Scandinavian power/prog band, I would not be so quick to dismiss them. Final Hour is quite well done with powerful well-crafted songs invigorated by equally dynamic musicianship.